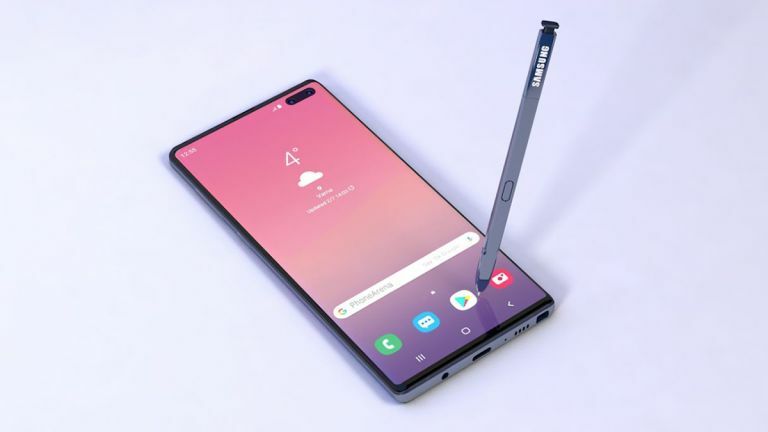 If you're after the latest Samsung Galaxy Note 10 leaks, news and rumours, then you've definitely come to the right place! We're expecting the next Samsung flagship to be unveiled in a few months, so keep checking back to get the latest information. We've already seen the Galaxy S10e, Galaxy S10, Galaxy S10 Plus, Galaxy A80, and bendy Galaxy Fold break cover this year, but there are plenty of reasons to get excited about the upcoming, all-new Samsung Galaxy Note 10 range as well. We're likely to see two brand-new stylus-touting handsets unveiled by Samsung sometime in July or August. Given the recent Galaxy S10 brand name, it looks like the Note series will also move to two-digit numbers – despite earlier rumours otherwise. Looking back at the Samsung Galaxy Note 9 launched in August 2018, it's a stunning phone – gorgeous design, loads of useful productivity features (and that S-Pen stylus), a huge screen... so how can Samsung improve on it? We haven't managed to sneak into any Samsung boardroom meetings lately – more's the pity – so we can only speculate for now. However, it seems a safe bet that the Galaxy Note 10 series will arrive in August 2019, which is exactly one year after Samsung first unveiled its Galaxy Note 9. That's also five months after the release date of the Samsung Galaxy S10e, Galaxy S10 and Galaxy S10 Plus. That gives those new phones enough time to make an impact before the next Samsung flagship arrives. As for the price of the Galaxy Note 10, you might want to get saving: the Samsung Galaxy Note 9 went on sale for £899 for the lowest configuration, and there's no reason to suspect its successor will get a price cut. Samsung is widely-tipped to launch two different Galaxy Note 10 models with different screen sizes and camera configurations. Both of these variants will have separate 5G-enabled models available in markets where the faster mobile network speeds have already rolled-out. That makes pricing a little complicated. We'd expect the smaller Note 10 to be a little cheaper. Just like the Galaxy S10 is more affordable than the bigger Galaxy S10 Plus. The Galaxy S10 starts from £799 for 128GB of built-in storage, and rises to £999 for the model with 512GB of built-in storage. Meanwhile, the Galaxy S10 Plus starts from £899 for the 128GB model, maxing out at £1,399 for the 1TB storage model with 12GB of RAM. Those Galaxy Note 10 models with support for 5G networks could cost even more than any of these Galaxy S models. Samsung has already announced a 5G-enabled Galaxy S10 handset, which is imaginatively named Samsung Galaxy S10 5G. Pricing is still under wraps, but we'd expect it to be at least £1,000, so expect the 5G-enabled Note 10s to be around that. AT&T has jumped the gun in the US by announcing that it will be bringing 5G support to the Samsung Galaxy Note 10, so we know that the tech is going to be embedded in the phone – that's one Galaxy Note 10 rumour we can confirm already. Indeed, code found in the Galaxy S10 suggests a 5G-capable Note 10 is going to happen. By now we know Samsung's approach to the design of the Galaxy Note series: big handsets with minimal bezels and curved screens. We'd be incredibly surprised if we didn't see the same Infinity-O display design make its way across to the Galaxy Note range (although the concept video above, from popular YouTube channel TechConfigurations, opts for a pop-up camera like the OnePlus 7 instead). By switching its Galaxy S10 range over to the new design, Samsung managed to squeeze larger screens into smartphones without increasing the size of the handset, and at this stage it's virtually certain that the Note 10 will go the same way. Samsung-centric blog SamMobile claims to have obtained the model numbers for the forthcoming Galaxy Note series. According to the leak, the Galaxy Note series will be compromised of two models – SM-N970 and SM-N975. As previously rumoured, these handsets will have a 6.28-inch and 6.75-inch AMOLED display, respectively. The smaller variant, SM-N97, will boast a rear-mounted triple camera system similar to what we've already seen on the back of the Galaxy S10 Plusand Galaxy Fold. Meanwhile, SM-N975 will have a quadruple set-up like the Galaxy A80 and upcoming Galaxy S10 5G. The latter, which is launching this year, adds an advanced hQVGA 3D-depth sensing camera to the triple-camera system on the standard Galaxy S10 and Galaxy S10 Plus models. However, it's unclear whether the Galaxy Note 10 will have the same four-camera set-up as the 5G-enabled S10, which will offer improved bokeh-style blur to Live Focus photographs as well as bringing the effect to video footage in real-time for the first time, or a new camera system. It's possible the camera on the Note 10 instead features some seriously impressive zoom functionality, too, now that Samsung has bought Israeli company Corephotonics, which is an expert in the field. What will all this technology look like then? We haven't seen any leaked photos, but Samsung enthusiasts have been getting busy with the unofficial renders. The image above, courtesy of PhoneArena, shows how the dual-lens front camera and ultra-thin bezels might look with a stylus. YouTube channel DBS Designing has also had a go at imagining what the next Note device might look like: you can see the video embedded below. If Samsung gets somewhere close to this, we'd be very impressed. There are cameras everywhere – even in the S-Pen. The codename "da Vinci" is being used for the Galaxy Note 10 range inside Samsung, according to recent leaks, which makes us think some kind of reinvention could be on the cards. It might point to a total redesign (da Vinci was famous for his designs), or it might be suggesting that the phone will be better for creatives – the S-Pen got extra Bluetooth-based features this year, so is Samsung going to give it another significant upgrade in 2019? Inside, we're likely to get a serious bump in specs – with the Qualcomm Snapdragon 855 or the Samsung-built Exynos 9820 likely to be aboard the Note 10 for super-fast processing, video editing, and improves battery life. However, it's possible that a new Exynos chipset will be available in time to power the Galaxy Note 10. The Exynos 9825, rumoured to launch later this year could give the handset even more of a boost in performance and battery life, as well as 5G network capabilities. Samsung only recently added a third camera onto the back of its latest entry into the flagship Galaxy S range. If this new Note 10 report is accurate, it seems like the Seoul-based company is moving fast when it comes to throwing extra lens around. We have heard one disappointing rumour though: that the Galaxy Note 10 will be ditching the headphone jack. The Galaxy S10 and S10 Plus may well be the last phones from Samsung to feature a 3.5mm audio port, which is a shame (get those USB-C dongles at the ready). It's still a few months before we're likely to see the Galaxy Note 10, so plans could always change. However, this latest rumour sounds much less confusing than earlier reports from the supply chain that pointed towards four drastically different models. We're still a couple of months away from an actual Galaxy Note 10 launch, and we'd expect plenty more in the way of leaks and tips to appear before the big day. In the meantime, there's no harm in us listing what we hope the new phone brings. Features we'd like to see, and which Samsung may decide to add, include a bigger battery, maybe as high as 6,000mAh. Remember these big Note screens need a lot of power to keep them running brightly, and even taking the lower power draw of next year's chipsets into consideration, some extra milliamp hours wouldn't go amiss. In fact, it sounds like the removal of the headphone jack might allow Samsung to stuff a bigger battery into the Note 10. Let's hope there is some consolation for losing the trusty 3.5mm audio port. And what about a super-strong, self-healing screen? We know that Note phones have always been pioneers in terms of their display tech (remember the Note series first introduced the curved screen edges), so the Galaxy Note 10 might well follow that tradition. Samsung already has a patent for the technology, so again it's just a question of whether it'll be ready for 2019. At this stage it seems unlikely, but it is a safe bet that the Galaxy Note 10 will be the most advanced handset Samsung has ever put out.